Opera is the free, fast alternative web browser that was made to discover. With unique features like Off-Road mode, Opera has been handcrafted to perform in almost any network conditions. Find something unexpected with the Discover recommendation tool, which that gives you the latest news, sports, and entertainment from around the globe. Or, access your favourite sites from your customizable Speed Dial. 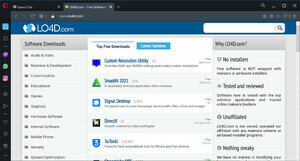 Version 60.0.3255.56 is a freeware program which does not have restrictions and it's free so it doesn't cost anything. For security reasons, you should also check out the Opera Web Browser download at LO4D.com which includes virus and malware tests. Additional screenshots of this application download may be available, too. Opera 18 has a presence on social networks. Opera 18 download been highly rated by our users.